Dinosaurs: the unequivocal rulers of the land and were virtually wiped out with the extinction event. There were no more dinosaurs left after the extinction event. 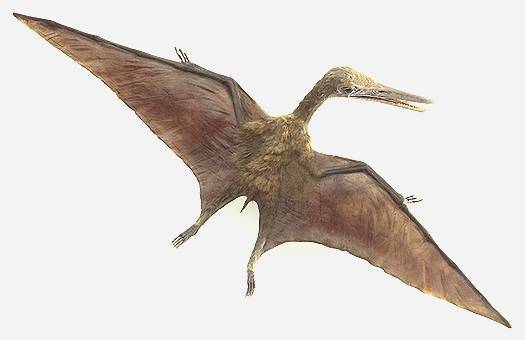 Pterosaurs: these flying dinosaurs rules the Mesozoic skies for 150 Ma before their demise. Birds: were quite abundant in the Cretaceous. Only one lineage of birds survived the event, radiating in the Tertiary to produce the diversity of birds present. 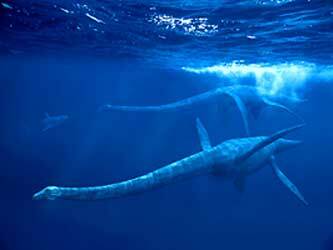 Marine reptiles: such as mosasaur and plesiosaur were extremely abundant in the Cretaceous and had vanished by the end of the Cretaceous. 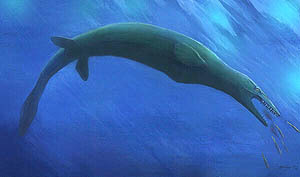 Figure: Artist's rendition of a mosasaur (top) and Plesiosaur (bottom) in Cretaceous oceans. (Courtesy of Encarta). Ammonites: went completely extinct at the boundary. Their extinction marks the boundary. 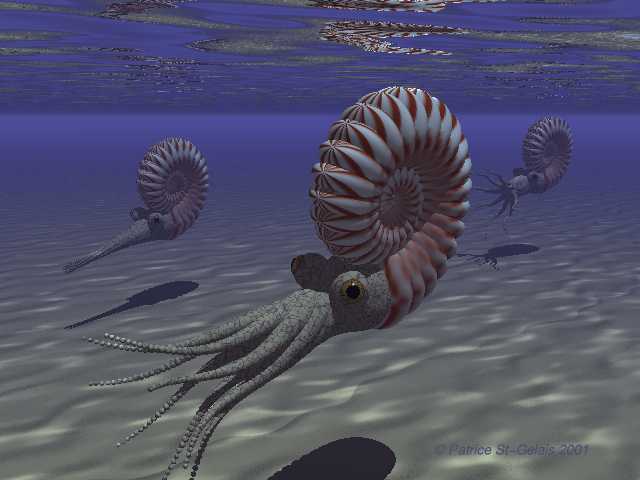 Figure: Artist's rendition of ammonites in Cretaceous Seas. (Courtesy of Encarta). Rudist Clams: had their numbers drastically reduced. Nautiloids: only two species survived. Bivalves and Brachiopods: suffered greatly. Plankton: the most severe extinction was among the nannoplankton, calcium-secreting algae and forams. Half of all plankton groups went extinct. The deposition of these organisms after death led to the creation of immense chalk cliffs that are found below the Iridium clay layer and marks the boundary between the Cretaceous and the Tertiary. Land plants: largely unaffected by the event, showing minute signs of the event. Insects: only a few species affected by the event. Mammals: survived in great numbers and then radiated in the Tertiary. Terrestrial vertebrates: crocodiles and amphibians survived successfully. Fish: almost all species made it through the Cretaceous. Some species were affected greatly compared to others. This could go back to how carbonate species were nearly extinguished while the siliceous species were not affected at all. Carbonate organisms form the base of many marine ecosystems; these ecosystems fell apart after the extinction after the removal of carbonate plankton from the bottom.